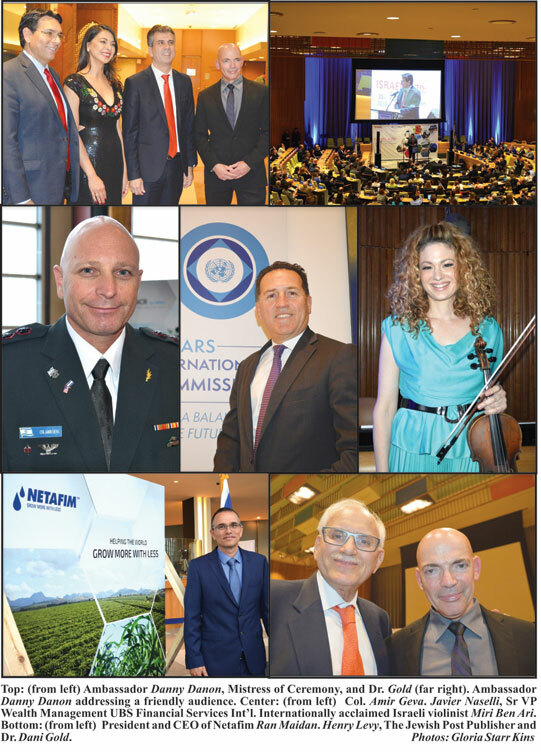 Israel's Mission to the United Nations and the Ministry of Economy and Industry hosted a special showcase of Israeli technology at the UN in honor of Israel's seventieth anniversary. Danny Danon, Israel's Ambassador to the UN welcomed a nearly packed hall of invited guests to the UN General Assembly and remarked, “I'm not used to such warm friendly faces in this building.” In discussing Israel's remarkable growth since 1948, he told of Ben Gurion's favorite expression, “We do the difficult quickly, the impossible takes a little longer.” Danon, in his capacity as Vice President of the General Assembly led a delegation of 40 UN Ambassadors to Israel. At the airport some expected to see a desert with camels. What they saw was indeed eye opening revelations. It has become a start-up nation with the third most listed NASDAC companies in the world. Scholarship, education and the will to succeed have become hallmarks of its people. And, he continued, just in the last 24 hours the county saw Iron Dome technology in action, protecting the people from terrorism. Eli Cohen, Israel's Minister of Economy and Industry mentioned that 100 years ago Theodor Herzl fantasized the Jewish State. Today it boasts twelve Nobel Prize winners and is the #1 country in investment research and development. As a nation with 60% of the land desert, it uses advanced agriculture technology to turn it into green fields. Israel uses technology to build international bridges for global technology. 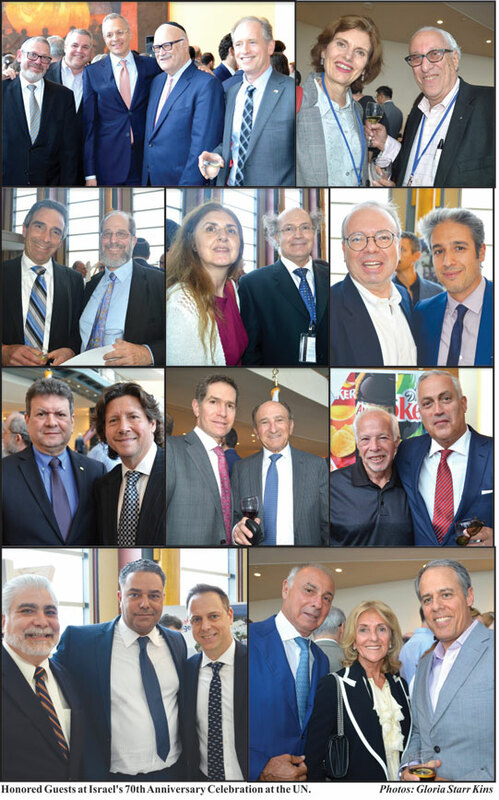 Devoted Zionist, owner of the New England Patriots and President of the Kraft Group doing business in over 95 countries, Robert Kraft was the next engaging and enthusiastic speaker. He spoke of growing up in Brookline, Massachusetts in a traditional Jewish family of three children who observed Shabbat. His dad taught him the Pirkay Avot with its values to live by and stressed three major principles: Respect for people, Dream big (Chalom Gadol) and Positively impact the life of others (Tikkun Olam). Kraft has led over thirty missions to Israel including one of NFL star players. He helps sponsor student trips to Israel in their senior year by matching the money they saved. He built the Kraft Stadium in Jericho, Israel in 1998 so people of all religions could play there and start to break down barriers. He also started “Our Generation Speaks” a full fellowship program at Brandies University and invested in solar box affordable power with a Palestinian woman from Gaza as the CEO. His early lessons from his father reinforced big dreams, respect and bringing people together. Dr. Dani Gold, out of a necessity to save Israeli lives, created the Iron Dome and is continuing with the R&D necessary to plan for security for years to come. His videos showing the technology in action was mesmerizing as he also discussed underground warfare that finds and eliminates tunnels, drones with special technology on it, guided lasers that can divert shoulder missiles aimed at planes, Israel space program surveillance satellites and the new Arrow 3 that can intercept missiles from Iran. The final presentation was from Ran Maidan, President and CEO of Netafim, a company that is shaping the future of agriculture and digital farming. By 2050 there are projected to be ten billion people which will require 60% more food. With this in mind, Israel invented drip irrigation, a system that waters plants and not fields. Netafim is the global leader in precision irrigation and is being used in the California wine country, India, Brazilian sugar cane fields, Europe, Mexico and many countries worldwide. The process is fully automatic controlled by a farmer's cell phone from data analyzed by Netafim. The need to innovate occurs every day with systems integrated by a brain to achieve sustainable development goals. Israel at 70 is remarkable. What we saw and heard was amazing and when one understands this was just a few examples of technological wizardry being performed in Israel every day it makes one's head spin. Not surprising to learn that there was an Israeli app for that too.